AutomatedBuildings.com Article - How can my company start offering innovative touch screen technology for BAS? The graphics have to be a little bigger and links, like sequence of operations callouts, require larger navigation links. Ken Sinclair came to me this month with a question. 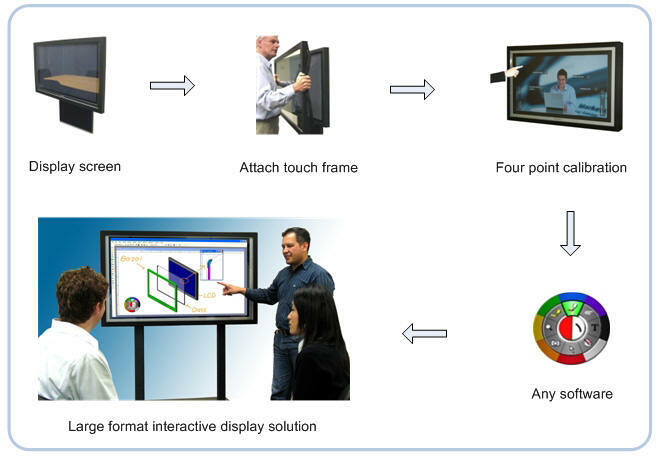 “How does Quality Automation Graphics promote touch screen technology into the Building Automation Systems (BAS) market? Is there something that you can share with our readers that might get them thinking of how they might be able to offer these solutions to their customers”? Jokingly I said of course as long as everyone buys from us. To answer the first question asked by Ken, I need to give a little background about how I got started in this business. I am the owner of 4Touch, LLC dba Quality Automation Graphics and got my start in interactive touch screen hardware back in 1996 developing interactive content and MPEG video for CD-i(CD interactive). From that I formed 4Touch, LLC in 2001 selling industrial touch screen PC hardware into food processing industry, which eventually matured into selling large format touch screen technology into the digital signage market. Currently 4Touch, LLC has two divisions Quality Automation Graphics and Interactive Green Design focusing on graphic design for the building automation industry and Green Touch Kiosks for Energy Efficiency Education. With my roots in touch screen technology, I understand the power of being able to easily interact with on screen content. If you look at the process automation industry as it relates to the building automation industry, they are leaps and bounds ahead when using touch screen GUI. You really can’t walk into a modern plant without seeing an operator touching a HMI to navigate his process via touch. We took that knowledge and started promoting it into the BAS industry with decent results. We have provided many different touch screen solutions that I will elaborate on. Data Centers are buying large format displays. Using large format monitors with or without touch allows them to put larger amounts of critical data on one screen. One of our customers had approximately: 35 15” and 17” monitors in a data center monitoring room. We provided a solution incorporating fully integrated 42” LCD’s with touch plus CPU and 42” stand alone monitors. They were able to accomplish better screen real estate usage by using large format displays while providing operators better data visualization with a total of seven 42” monitors. Utilizing space saving ceiling and wall mounts provided the end users with an ergonomic display design. HVAC monitoring is another area where we have had success selling touch screen systems. Many large facilities see the advantage of using touch screens, replacing the traditional mouse and keyboard. Many times space is an issue with an operator interface and touch screens don’t require much room because no mouse or keyboard is needed. 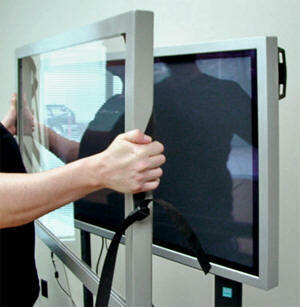 We have sold both large format touch solutions and smaller touch systems. One thing to note when promoting touch is to make sure the company developing the operator interface makes the navigation buttons large enough for touch. Later in this article I will discuss content design. Green Touch Kiosks for Energy Efficiency Education is a growth area that is advancing very fast and the use of a touch screen solution is a must. Many building owners that are qualifying for LEED certification can earn an additional LEED credit for displaying energy saving data to the public. The use of a touch screen display is the best way to do this. It provides an easy turnkey solution that almost anyone of any age can easily navigate. Even if the building is not LEED certified, we have done many projects for owners who just want to show the public what they are doing to help save energy. 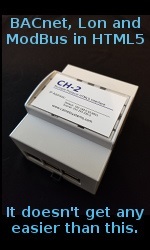 For more information read the January article titled “Out of the Box Energy Monitoring”. The kiosks we use are also made in the USA. Last, we are providing solutions that fall more into the digital signage arena but have synergies with the building automation industry. Many facilities are taking advantage of touch screen technology by providing information to the public. Hospitals are using touch to showcase donor recognition and physician finders. Large buildings and campuses are also seeing the power of having interactive way finding or navigational systems in place. This allows people to easily navigate large facilities with a touch of a screen. Some have even provided a detailed print out of directions for the person to carry with them as they go towards their destination. Other uses that we have provided content and touch screen hardware for include: marketing and advertising content, condominium amenities kiosk, museum kiosks, building informational kiosk, and many other applications. Briefly I would like to talk about how to develop and modify content so it is easily navigable for a touch screen. Developing content for any of the discussed solutions does have some tricky caveats. The biggest recommendation I have is to fully plan the content design before you begin. Keep in mind that if you want people to use the touch screen, it has to be easy to use. Content that is interactive should have a large enough surface for an index figure to activate. Many people think you can just take a website and plop it onto a touch screen and it will work. In theory, the layout is good but if you have any links or small buttons it makes it difficult to navigate. Keep it simple and people will have a good experience. Using BAS interfaces and incorporating them into touch applications is also fairly easy. The graphics have to be a little bigger and links, like sequence of operations callouts, require larger navigation links. Experienced graphic designers shouldn’t have any problem adjusting their design techniques, keeping the touch applications in mind. Quality Automation Graphics has extensive experience in developing interactive content. We have strategically allied ourselves with Nextwindow’s technology because to its superior touch technology for large format displays. NextWindow's proprietary optical touch technology can deliver a fully interactive solution for panels up to 100-inches. The company provides its solutions as simple overlays, that can be strapped in placed over any existing screen enclosure - without disturbing the manufacturer's warranty or creating any complex mounting issues. Their touch screens use clear glass and are plug-and-play USB devices. We also have partnered with a USA manufacture to offer fully integrated LCD’s using NextWindow’s optical touch technology with a CPU contained inside the LCD, a true turnkey solution.